Bring a medium sauce pan to medium high heat, add 1 tablespoon of olive oil and red onion. Saute for 3-4 minutes until onions become translucent. Add garlic and saute for 30 seconds add in crushed tomatoes, salt and pepper. Bring to a boil, reduce to a simmer and cook for 10 minutes. Set aside when finished. Spray a baking sheet with PAM cooking spray, set aside. In a large shallow dish add panko, parmesan cheese, and dry basil. Toss to mix. Pat chicken cutlets dry. Pour 1.5 tablespoons of olive oil in small dish. Using a cooking brush, coat both sides of the raw chicken with olive oil. Put coated chicken in panko mixture and generously coat both sides. Be sure to press the mixture into the chicken so it sticks. Bake for 15 minutes, turn over back another 15 minutes. Top each chicken breast with 1-2 tablespoons of tomato sauce and 1 slice of mozzarella cheese, bake for 5 minutes until cheese is melted. Heat a large skillet to medium high heat. Add grape seed oil and zucchini noodles. Saute for 2-3 minutes. Remove and let sit for 2-3 minutes. 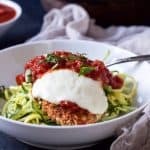 Serve Zucchini Noodles with one chicken parmesan and top with a little tomato sauce and fresh basil.